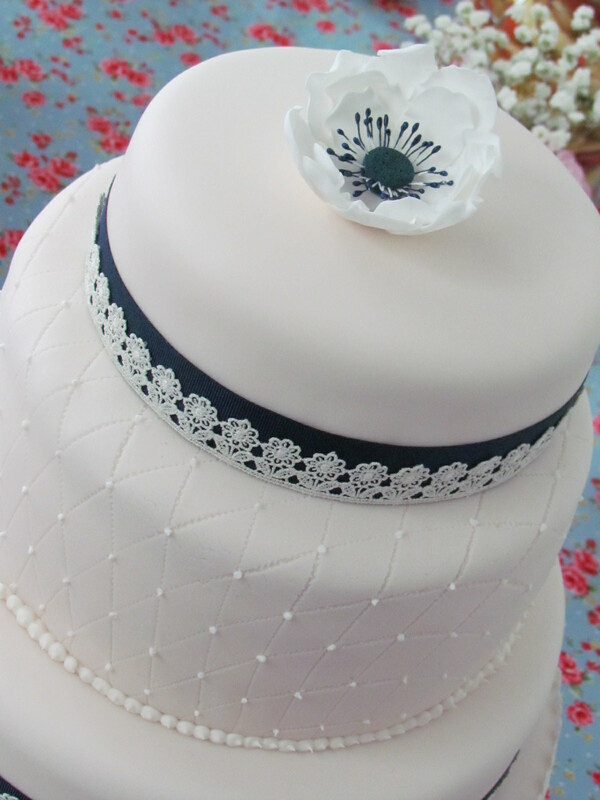 Delicate lace work with bead piping round rich sherry fruit cakes. 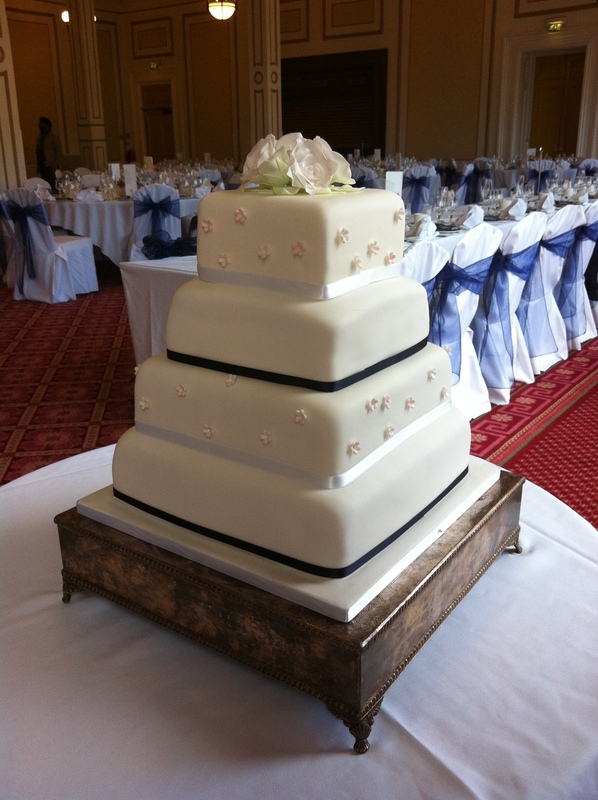 A fruit cake, ginger cake & lemon Madeira cake. 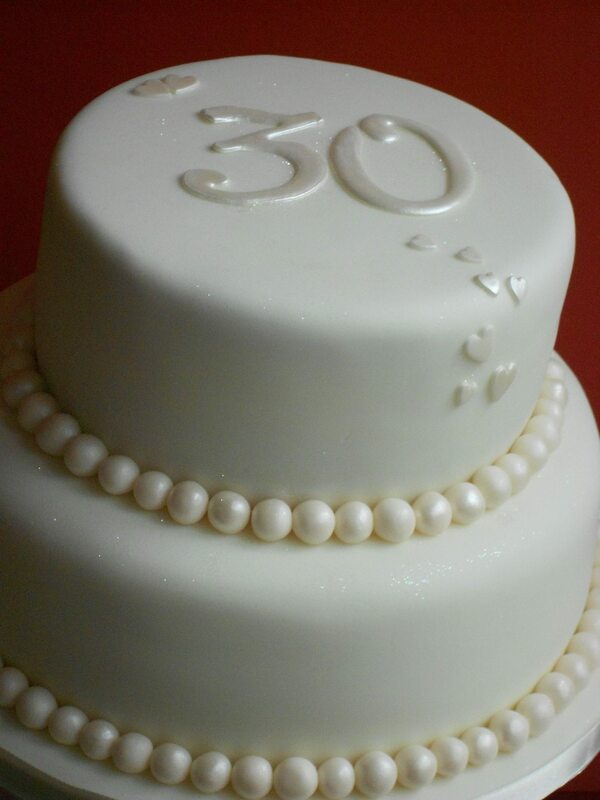 A chocolate & vanilla marble cake covered in soft pearl-coloured icing for a 30th wedding anniversary. 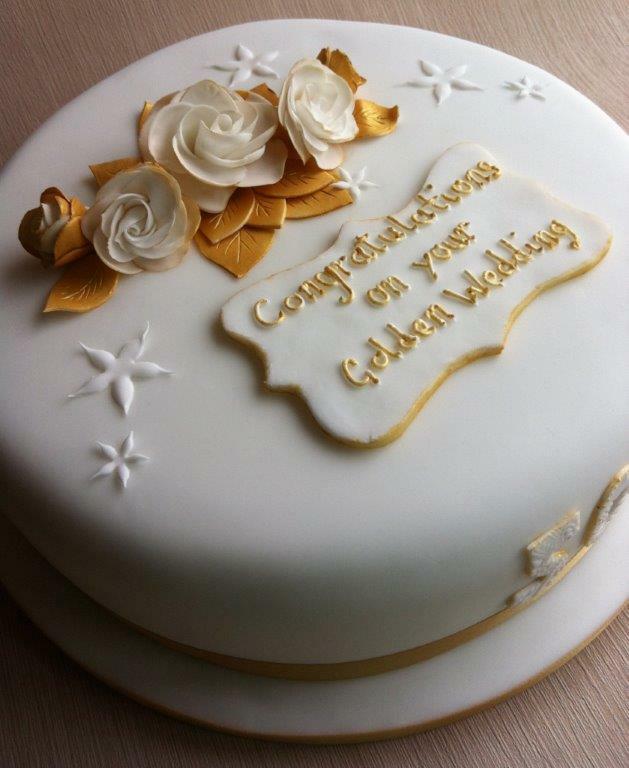 A vanilla vodka fruit cake, to celebrate 50 years of marriage, and for the children, chocolate cupcakes with vanilla butter-cream, fondant flowers, & gold stars. 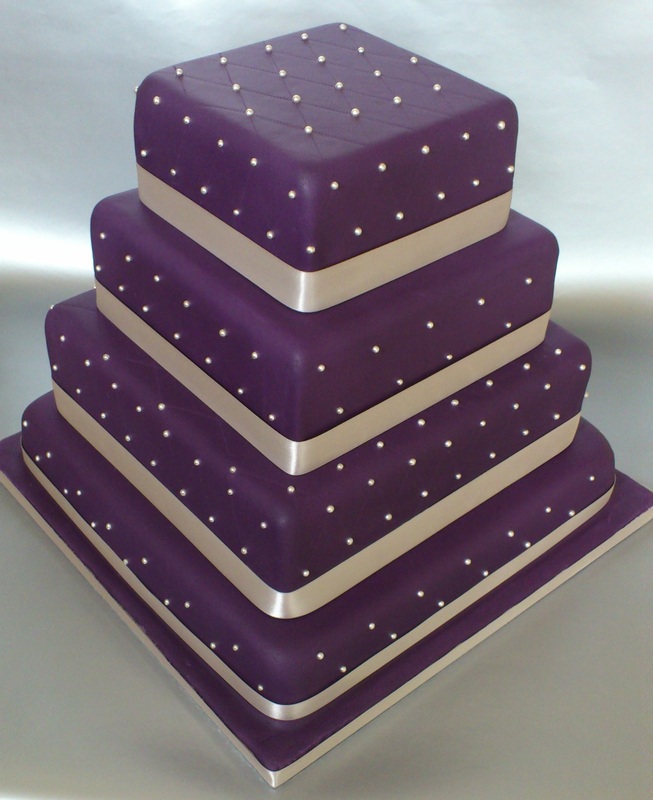 Bottom tier was fruit, middle chocolate and top vanilla. 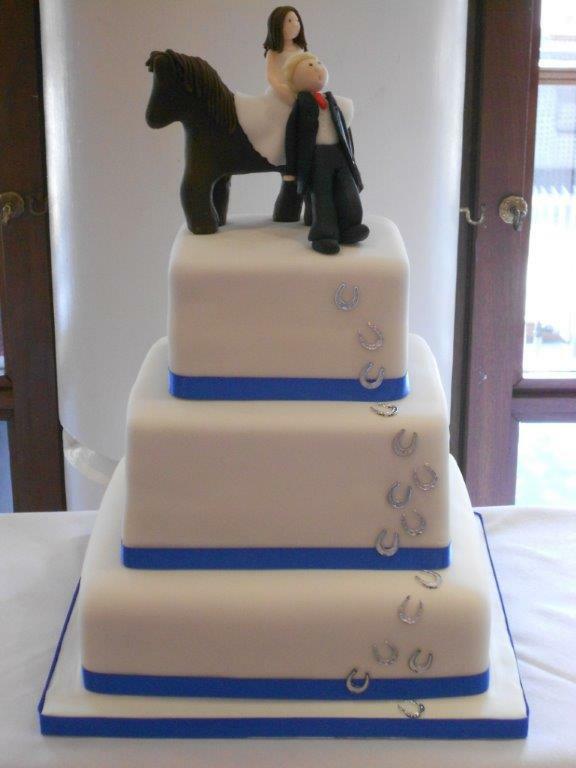 Cake topper is of bride, groom and the bride’s horse, Heath. 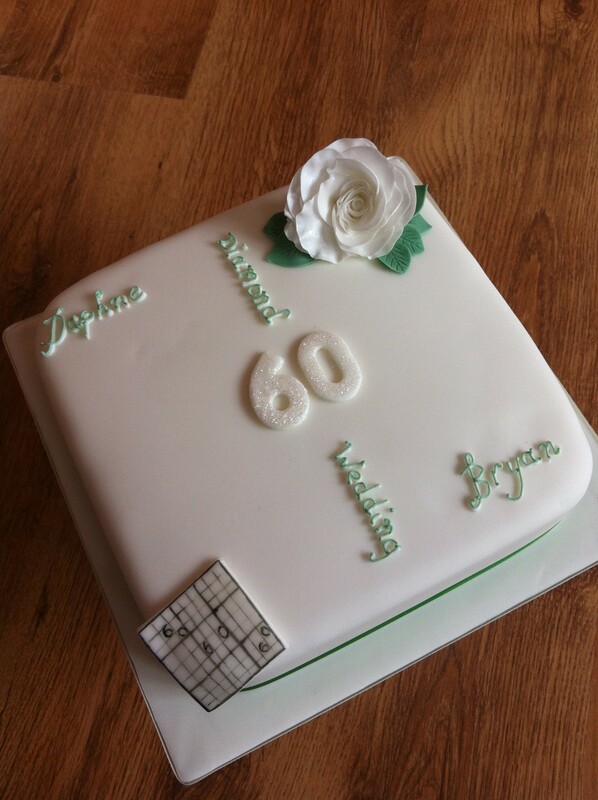 A classic square cake for Bryan and Daphne as they celebrate 60 years of marriage. 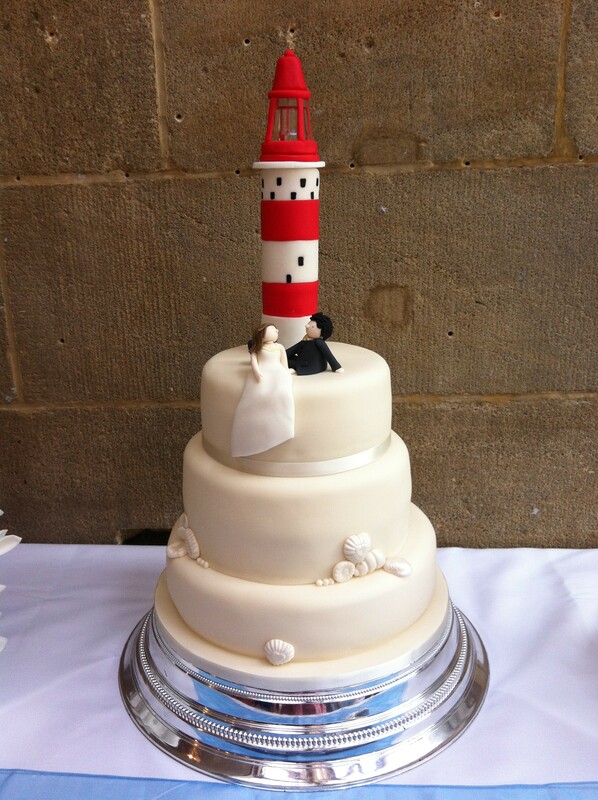 A seaside theme for this wedding cake with ivory icing, pearl lustred seashells and a lighthouse. 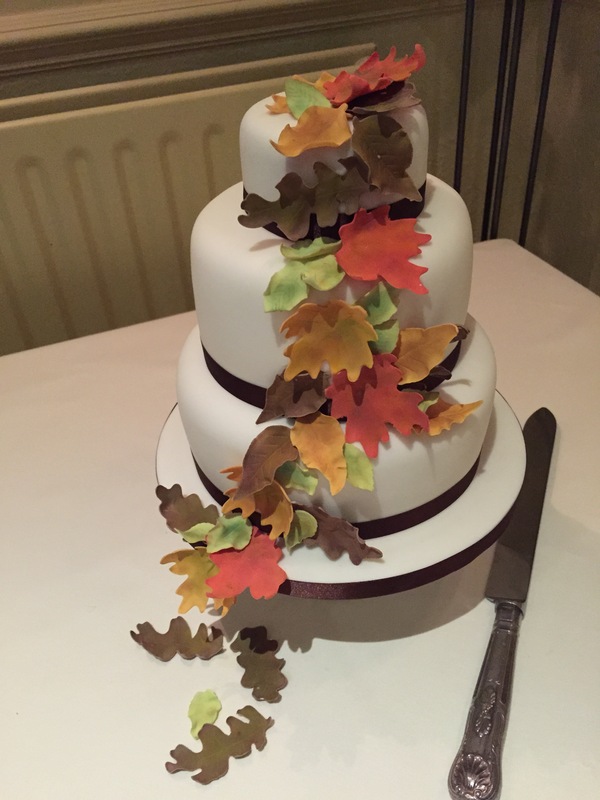 The autumn leaves were made by colouring petal paste in green, brown, red and orange and then ‘titivating’ them by dabbing a mixture of edible lustres to try and give them a bit of depth of colour. 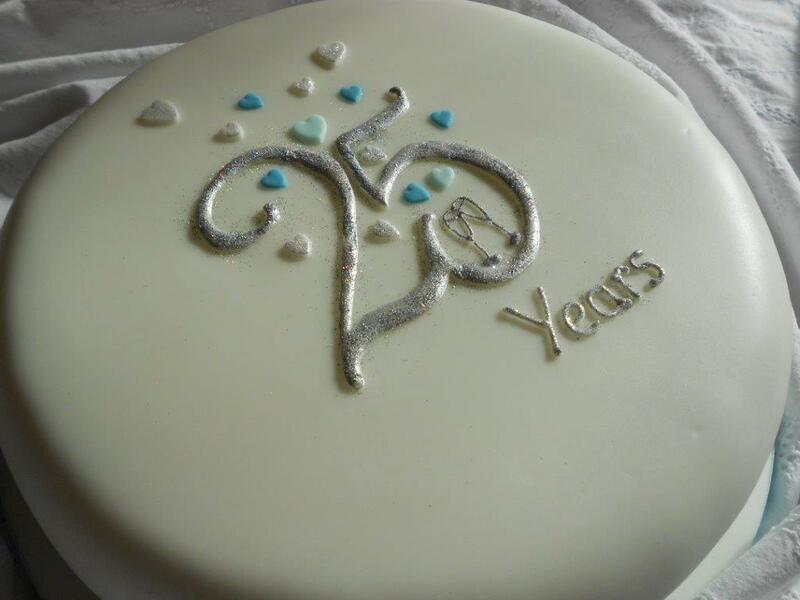 A vanilla vodka fruit cake decorated with a design inspired by an anniversary card. 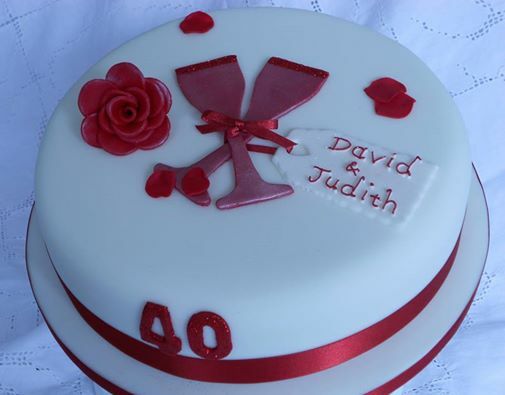 A moist sherry fruit-cake decorated with soft cream icing and fondant decorations. 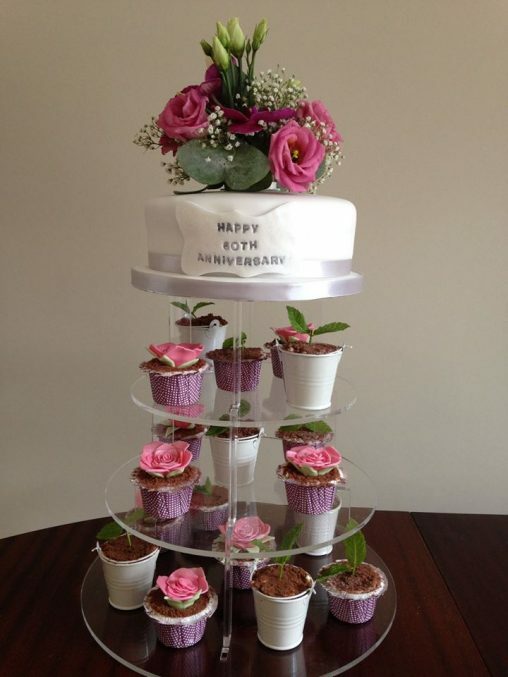 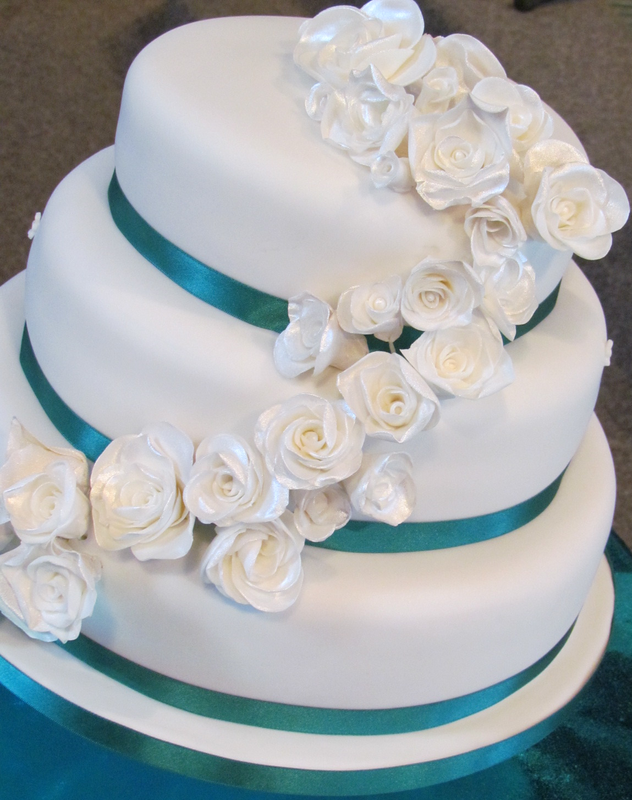 A three-layer cake of fruit, chocolate & lemon sponges with hand-made roses and a teal ribbon. 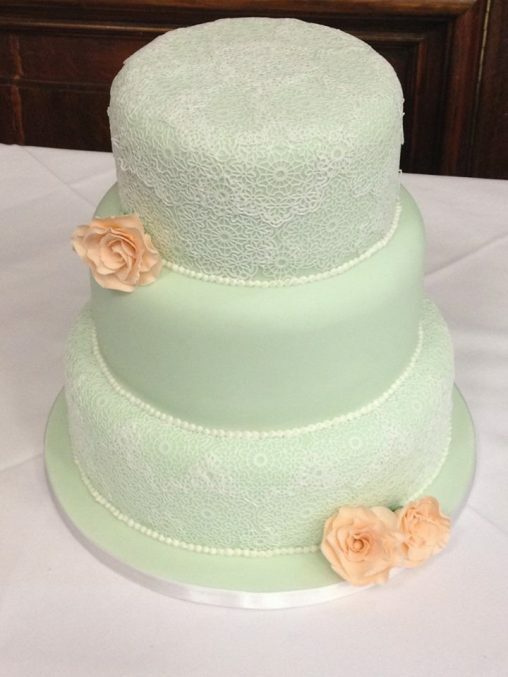 Mike and Eliza’s wedding cake. 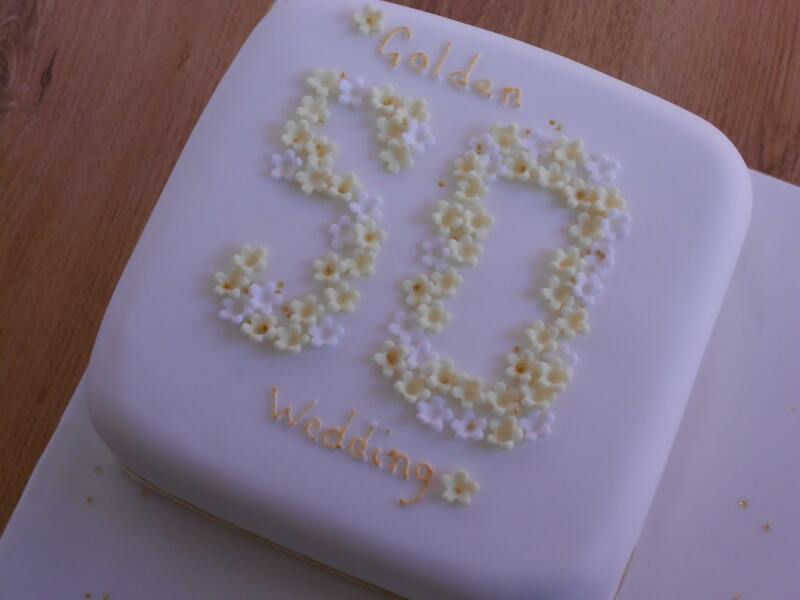 A golden cake for John and Sue’s 40th anniversary. 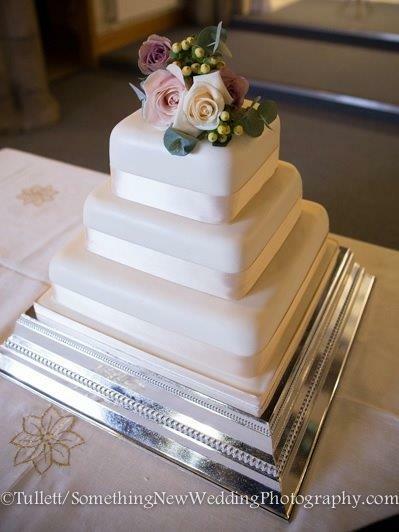 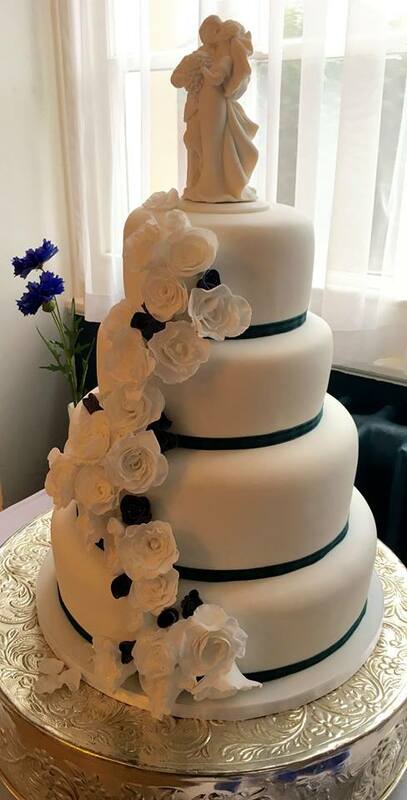 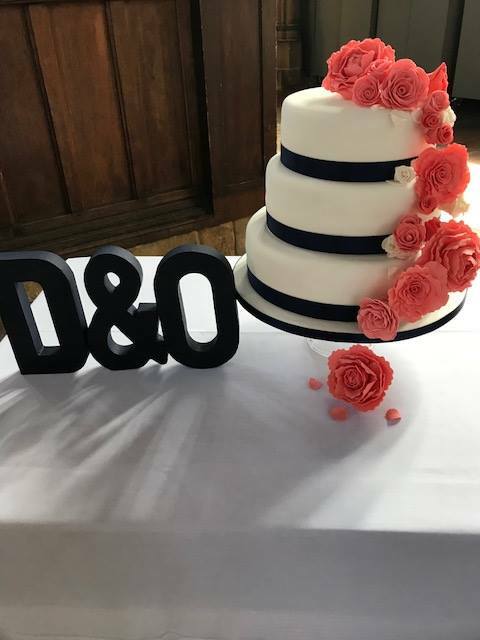 A three tier fruit cake and covered in ivory icing with ribbon to co-ordinate with the dress and a real flower posey for the top. 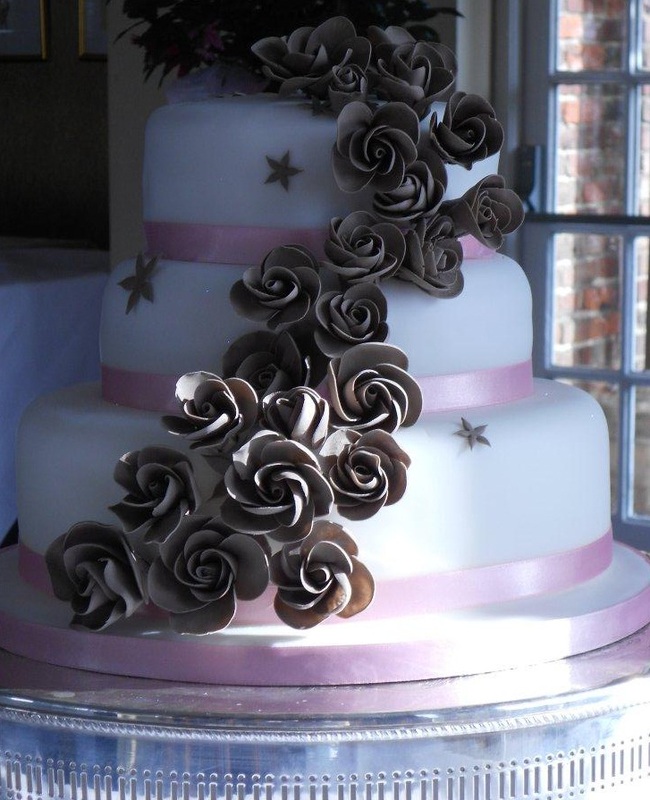 Chocolate sponge cakes covered in soft white fondant with the now obligatory handmade sugar roses, this time in chocolate-coloured petal paste. 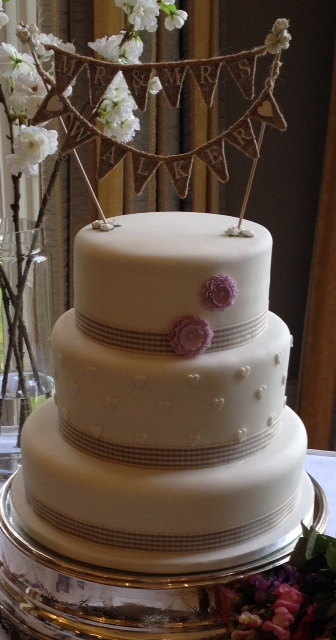 An Art Deco-inspired cake for Amy’s wedding at Ripley Castle.